Quebradeiras coco babaçu, tradittional activity. ENEVA operates one of the largest natural gas-fuelled thermoelectric power generation complexes in Brazil. Local communities (such as "quebradeiras de coco") complain about pollution, health and environmental damage. The Thermoelectric Complex Parnaíba is located in the Maranhao State. This project is the largest natural gas-fueled thermoelectric power complex in Brazil and is made-up by four plants; together they reach 845 MW. The plants are synchronized with the Interconnected National System (SIN). The natural gas supplied to the plants of the Parnaíba Complex plants comes from the production wells in the Parnaíba Basin, and represents approximately 40% of the Brazilian onshore production. This project was inaugurated in 2013. But it has being built since 2009 supported by different financial sources such as World Bank and Brazilian Development Bank (BNDES). It is s a joint venture between MPX (ENEVA), OGX Maranhão and Petra Energia S.A. It was built by Duro Felguera (Spain). In 2011, OGX Maranhão (ENEVA) receives the preliminary license for the Natural Gas Production in the Parnaíba Basin. 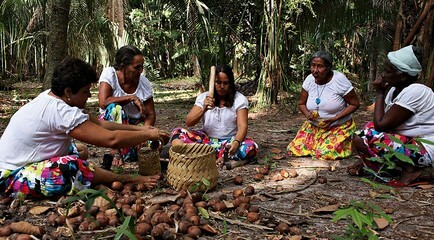 During the construction of the project, traditional communities (quilombolas and quebradeiras de coco babaçu) together with local and national organizations (Sociedade Maranhense de Direitos Humanos (SMDH), Asociaçao de Mulheres Quebradeiras de Coco (AMUQUEC) and other EJOS put a demand for ask for compensation and denouncing damage in the environment , shortage of palms of coco babaçu (main activity of women along the forest), noise pollution, pollution of rivers where fishermen used to fish, water scarcity and damage to their livelihoods. According to the communities denouncing the facts, one person affected by noise and stress committed suicide. There also some supporters such as priesst and Asamblea de Deus organization. Beyond the judicial demand, some actions such as public demonstrations, damage to the company´s property and blockages were also deployed. In 2014, the court decided in favor of the local communities and forced the company (ENEVA) to resettle the affected families; "In a non-renewable period of 180 days. To be made effective resettlement, under appropriate conditions, all the families affected by the Parnaíba Thermoelectric Complex. The process must comply with the conditions stipulated in the resettlement plan approved by the SEMA, the environmental impact assessment and the agreement signed with the affected people." In 2015-2016 the company has begun the resettlements but the livelihoods of the communities have extremely changed and the pollution continues. Project Details ENEVA reported in 2015 thatit operates one of the largest natural gas-fueled thermoelectric power generation complexes in Brazil, a pioneering project that integrates natural gas production to power generation. The Parnaíba Complex comprises the thermoelectric plants Parnaíba I, Parnaíba II, Parnaíba III and Parnaíba IV, which are installed in the municipality of Santo Antônio dos Lopes, in the state of Maranhão. The gas used as fuel for the plants is produced in the exploratory blocks of Parnaíba Gás Natural, in the Parnaíba Basin. The plants Parnaíba I (676 MW), Parnaíba III (176 MW) and Parnaíba IV (56 MW) are currently in operation and supplying power to Brazil's National Interconnected System (SIN). When the operation of Parnaíba II is started (518 MW), the Parnaíba Complex will reach 1,425 MW in operation. This project is in operation and supplying the Brazil's National Interconnected System (SIN). Development of Alternatives Alternatives were already on the ground before the construction of this project. Traditional communities (mostly women) used the forest to extract coco babaçu to sell oil and other products. And men used to work in agriculture. Why? Explain briefly. The court decided in favor of the environmental justice organizations and one of the solutions was the resettlement of the affected communities. But traditional activities such as extraction of coco babaçu by women groups and agriculture activities have been interrupted. With this project the economy and livelihoods of these families have changed changed. The project is in operation.